Last November I had the opportunity to speak to the St. Cloud Heritage Quilters. 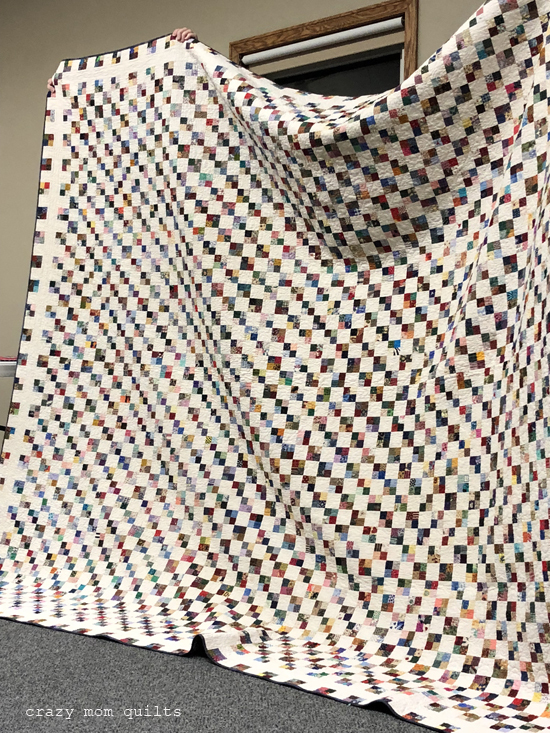 A woman named Jean Gilbertson brought this amazing quilt for show and tell that literally made my jaw drop...in the best way possible, of course! If I recall correctly, this is at least a queen size quilt. It was truly stunning. Each of the 4 patches finish around 2", so each individual square finishes at about an inch, I believe. -There is only one seam in the center to match up. -Playing with fabric combinations within each block is a delight. -They are addictive. As I was sewing, I found that I kept telling myself, 'just one more'. -They are QUICK to make. -It's easy to check the block for accuracy with a 2 1/2" square. Did I mention that it's FUN sewing up scraps??? I'm having a blast! A friend asked me, "how many blocks do you need to make?" I think this is one case where it's better to NOT do the math quite yet. Why take all the fun out of it so soon? Hahaha! I decided to name my quilt "Lost in the Crowd", for a few reasons. One, because it would be really easy to camouflage ugly scraps and get away with it. Two, if you wanted to point out a favorite fabric to someone, good luck finding it! I can definitely see the appeal but wow that's a lot of little blocks. I can't wait to see yours. her colors are more muted than your usual palette and one thing I noticed looking at the whole quilt is that there more of an overall effect than a sense of different colors or patterns. I'm curious to see if it will be the same with bolder colors. Good Luck! It will be amazing. Love this! your colors are so yummy and so you! Love your name choice. Definitely a great way to hide ugly fabric. It is amazing how ugly fabric is not so bad when you cut it tiny! I've been cutting 2" squares and making 9-patches. I'm not counting the pieces until it is finished!! I’ve sewn a box full of this size 4 Patch for a quilt, they are getting triangles around for a square in square look. They are great leader-Enders and fun to make, as you say! Enjoy! Amanda Jean! It’s so inspiring... per usual! Bet you finish way quicker as they’re so fun !! Are you going to go with a light background ? I’m thinking it would be a fun way to use up solid scraps too !! Amazing. You have a lot more patience than I do! When you named it "Lost in the Crowd" I somehow changed it in my mind to "Lost in the Cloud" - since you were in St. Cloud! Gorgeous blocks, glorious quilt - just my sort of sewing. I have lots of 1" square samples from the olden days when my LQS sent them out to customers for mail ordering purposes - I think I have just found the project, though they may be just too fiddly. Love your blog and your constant enthusiasm and inspiration. Thank you. Such a fun project. Do you have a plan yet for how you're going to assemble it - as you go along, make all the squares first, work from one corner outwards, etc? I'm interested because with something as intensive as this, my usual method is to work from the centre out, and keep going till I either lose the will to live or decide it's large enough! What a stunning quilt - love it! Hmmmm - this has given me an idea too. Love what you are creating. Thank you for sharing! I can feel your excitement with this project and it's contagious! Wow! That is a gorgeous quilt! I can't wait to see yours as well! I may have to start my own version! Thank you. How fun! I have a gallon zipper bag full of 1 1/2" strips... I wonder how far i could get with that? NO, I can't! Stunning wuilt! I cam nderstunderstand why you want to make it! These would be great as "leaders and enders" which just might make me want to tackle it, too! Oh the original quilt is stunning. I can see how you needed to start one. I love seeing so many great fabrics all together. I love it! Many years ago, I made a larger-than-king-size quilt (about 120 inches, I think?) from blocks that small, arranging them in 9x9 squares with 3-inch sashing. It was AMAZING. I gave it as a wedding gift and the couple divorced after about 2 years. I still wonder where that quilt ended up. I love that quilt!!! I am going to make it too! This will use up a ton of scraps!!! Thanks for sharing!!!! Now that’s a scrap buster! And a really fun perfect “leader and ender” project. And great for those days when you really want to sew but you only have a few minutes and it’s not possible to concentrate on a more complicated project. Happy sewing! How fun! 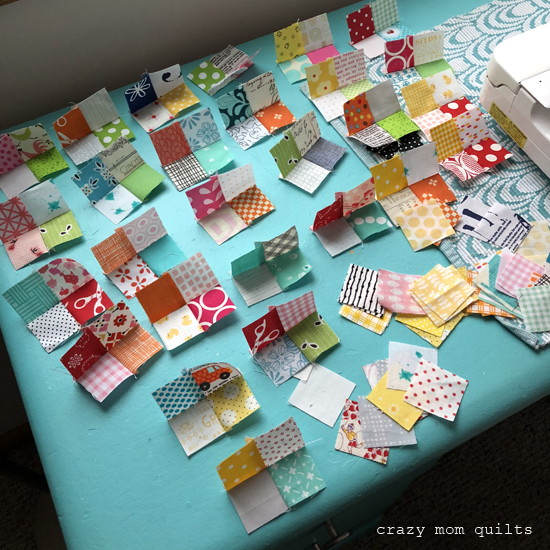 I've been cutting 1.5" squares as part of my scrap processing, without any firm idea of what to do with them - but now I have a plan!!! Thanks so much for the inspiration!! This is fantastic! Makes me wish I had a pile of tiny squares! And I don't do tiny...but I may have to make an exception! Yours look pretty against that aqua table.....That big quilt is jaw-dropping! Thanks for sharing with us! I see you press to the dark, but do you press the center seam open or just pick a side? Also, what color will you use for the plain block. This will be a fun quilt to watch come together. I currently have a project going that uses 1.5" squares in a 9-patch, but I like this quilt too, so I may try to do it using 2.5" squares. I usually save my 2.5" squares for leader-ender projects, and this would make a good one! Thanks for passing on your inspiration and inspiring me! OMG! I really love that quilt and the border is perfect too! I saw a similar one on Pinterest made with 9-patches which really made an impression on me. Now, after seeing this one, I know I need to start one soon. Thanks for the inspiration. Pulled out my scrap bin and started cutting....the pile of squares and dwindling scap pile is a motivator...can't wait to start sewing. Lovely! A great idea for those pesky small scraps you just can't throw away. And I too know the feeling of sewing squares together and rolling my eyes when I see them later! Onward!! 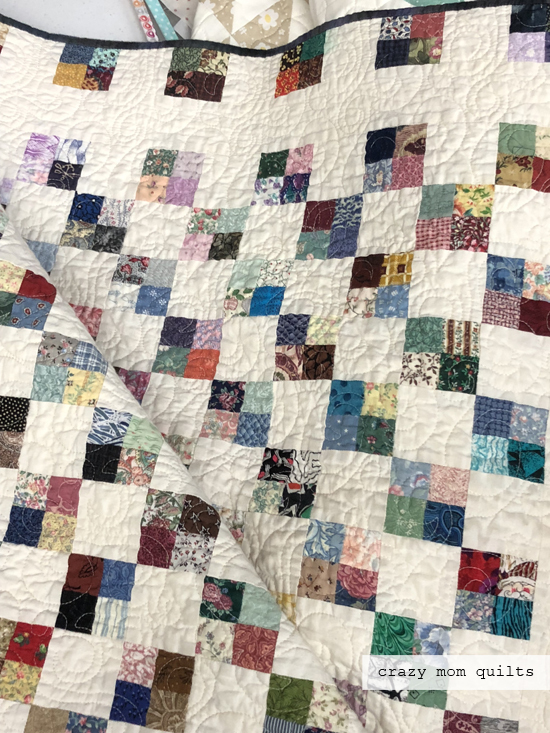 The quilt reminds me of the "Omigosh" by Susan H. Garman, distributed by Quakertown Quilts Inc, which I bought in 2006 and don't have the strength to even start it! Just love those modern fabric pairings! Part of me ( the insane part ) really really wants to do this too!!! But, gosh.... wow. On my way to my sewing room to look at my bin of tiny scraps I couldn't throw away! I believe you just gave new meaning to your blog's name! 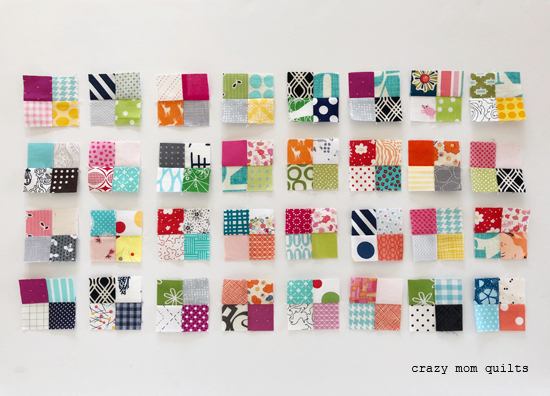 Crazy Mom Quilts!!! That quilt is amazing! I can see why you would want to make one for yourself. In fact, I think you just gave me the itch, but we will see...I have a jillion other things to finish first. I am looking forward to watching your progress on this one. I think it will be dynamic! Wow! Love your idea of waiting three months, but I’m not sure I could wait on this one! I so agree, don't do the math yet. lol It is a gorgeous project. Another great idea. This is the perfect leader and ender project as you can add background when finished all the blocks. I am starting one! Looking at the last picture, those four patches look so nice against the aqua. I was ok avoiding the urge to make one until that last picture. Now I have to make one, set with solid aqua squares! You make me laugh (always a good thing)! 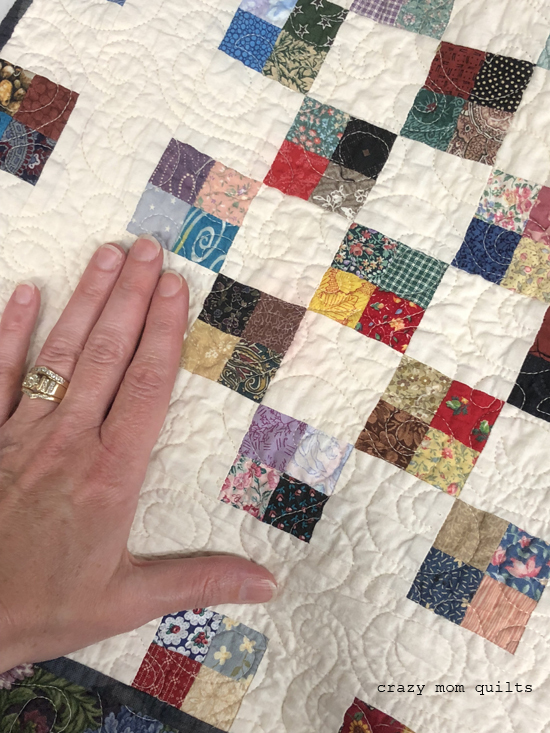 I’m all the years of reading your blog and seeing your quilts, I can honestly say I’ve never seen you use an ugly scrap. Maybe you have and I missed it, but I don’t think so. Time to come visit and I will share my squares. You know I have plenty for the both of us. It will be amazing. All I could think of when I saw this amazing quilt---------Wheres Waldo? Love this quilt!. 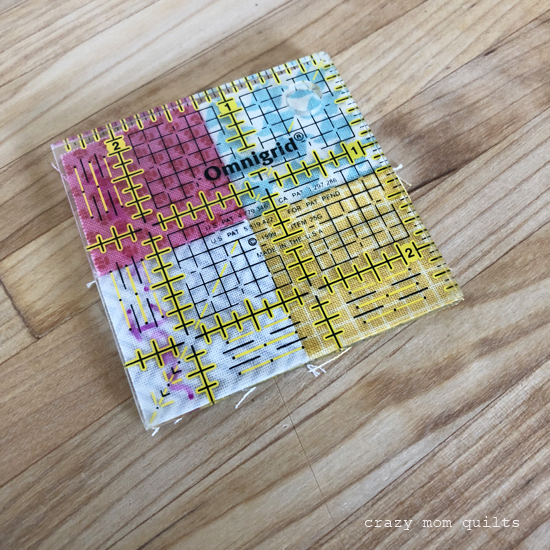 I have a box of 2" squares I use as leaders and enders to get four patches. In a previous quilt I surrounded the four patches with a 1" neutral border and alternated these 5" blocks with 5" squares from a variety os medium-big size floral patterned fábrics. Now it's a WIP on the hand quilting stage. After seeing your quilt inspiration I decided I will make a quilt like this. I think they will be a gift to two of my nieces. I hope Jean follows your blog. Her quilts are amazing. Wow - what an outstanding use of those teeny scraps. What an inspiration! I have hundreds of 2” squares, this would be a great way to use them. I think this is a lot prettier than a postage stamp quilt. A great name for it too! Love this quilt. Thank you for sharing. I'm going to make it too! Oh boy, now I need to make one too. As I've been reading through the comments I have noticed how many other people want to make one too. Have you thought about making it a quilt along with some sort of link up??? Think about all the scraps that would get used up all over the world. A beautiful QUILT, and a great leader ender project ! Count me in ! I think the aqua table adds a lot! Use that color for the alternate blocks! 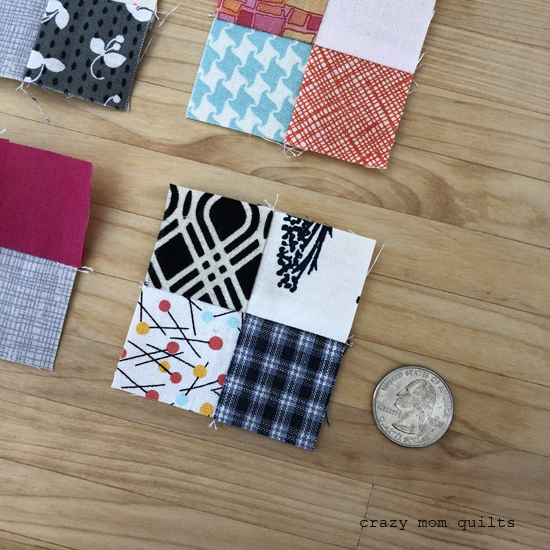 1 1/2" is the absolute smallest I will save, intending to make a postage stamp quilt some day and it will have a little bit of everything that has passed across my cutting table. I love that quilt! I have a whole bunch of that size 4 patch made already and even more scraps cut into 1 1/2" squares to make more. I made them as leaders and enders for a couple of years :) Your blocks are looking fantastic and I love the name! Jean G is a very talented quilter...and a great friend. I was lucky to see it come to its conclusion over years! of work. and yes...she reads here with me. Amanda Jean...we love your work and your presentation was excellent in Nov! Holy moly, I LOVE this idea. I keep thinking that the ideas I see for scrap quilts aren't really scraps - they all are picked to match. I could truly use my tiny scrap pieces for this! magnifique!!! je vais sur ton idée le commencer merci pour les explications. Another great idea and yes, you are right about being able to use up some "ugly" scraps. There are so many color options with this quilt too! Light scraps with a really interesting colorful solid background....Thanks for sharing this Amanda! Oh wow, I had a feeling I would see something like this after seeing your reaction to the quilt that evening. LOL It will be lovely! I love this! And I want to do make this! Thanks for sharing. It's beautiful. I am going to make one as soon as I finish my king size quilt for our bed. Thanks for the inspiration. I am going to reduce my scraps by cutting them to 1 1/2" squares. I love how the white in between the 4 patches gives it a more up to date look and lightens the quilt. What a great way to use up some of my 1 1/2" squares! I look forward to seeing the finished product!